Stencil Patterns Can Make An Outdoor Table Look Like New! Good morning, my Cutting Edge Stencils friends. Spring is here and now is the time to get your outdoor space in tip top shape! 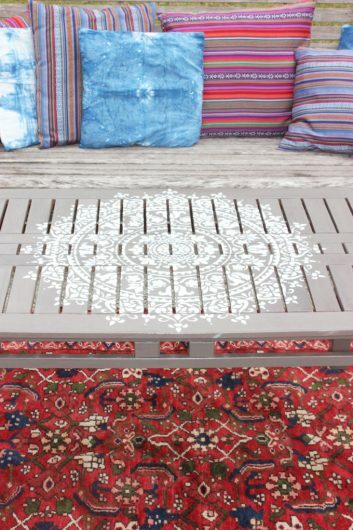 Our Mandala Stencils are perfect for adding an exotic splash of pattern to any outdoor decor item like a table. 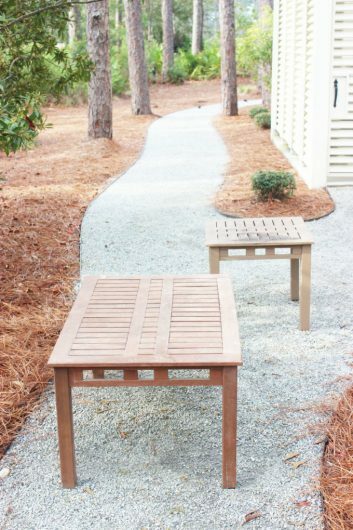 Today we are sharing how to makeover an old outdoor table using wall stencils. We’d like to welcome back Maria, the clever crafter and home decor enthusiast behind the blog Simple Nature Decor Blog. With Spring on the way, Maria was working on putting together an outdoor tablescape. She had this old wooden table that she felt would be perfect for the space. It was worn and dated but Maria felt like it had a ton of potential. The first thing she did was sand it down and stain it using Briarsmoke by Rustoleum. The beautiful gray color needed two coats. Then Maria decided to enhance her newly stained table with a beautiful Mandala pattern. She chose the Prosperity Mandala Stencil, one of our most popular Mandala designs. Maria set up her supplies and started stenciling. She used blue painter’s tape to hold the stencil design in place on top of the table. Maria poured her white acrylic craft paint onto a foam tray and then lightly coated the roller. Be careful not to overload the roller with paint. Roll off the excess paint onto a folded paper towel until the roller looks almost dry. The key to stenciling is using as little paint as possible. Too much paint will cause the design to bleed and smudge. 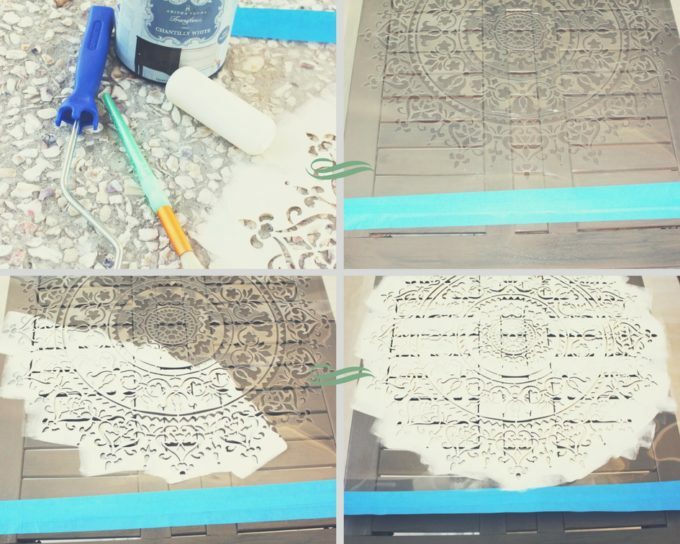 Once the Prosperity Mandala design was fully painted, Maria peeled back the stencil to reveal the pattern! This is always the exciting part. 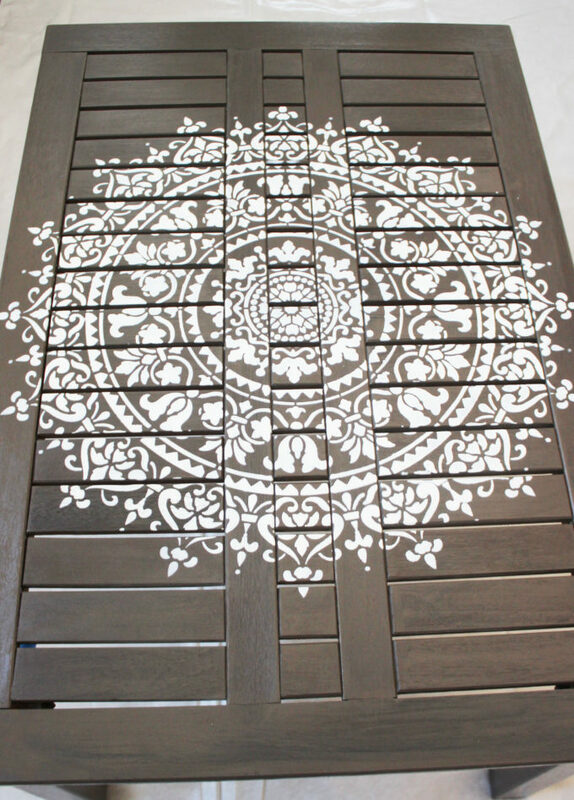 Are you ready to see how her stenciled outdoor table turned out? Here it is! Maria had this to say about her stencil project, “I have been looking forward to doing this Spring Tablescape but wanted to do something unique. It took me sometime to come up with a Moroccan tea party theme. 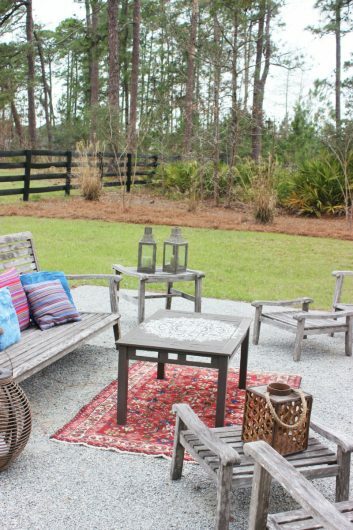 The biggest persuasion to go with this theme was I had painted my old outdoor table a beautiful shade of gray and stenciled a large medallion on the center of the table. ” We’d say her table was the perfect inspiration for her backyard bliss! To see more of Maria’s Spring tablescape along with her Moroccan styled tea party, please visit her blog Simple Nature Decor. 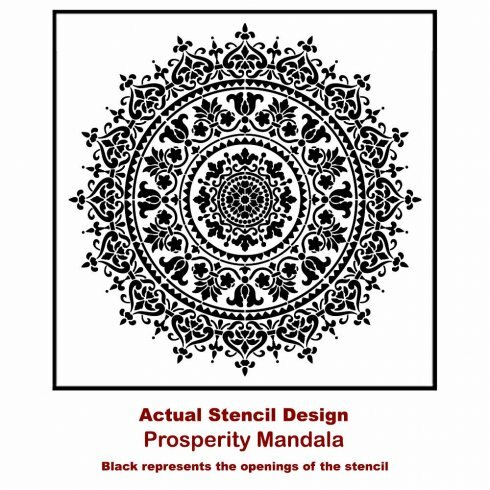 Tell us: How would you use the Prosperity Mandala Stencil to decorate your home? Leave us a comment below! Would You Stencil An Accent Wall?